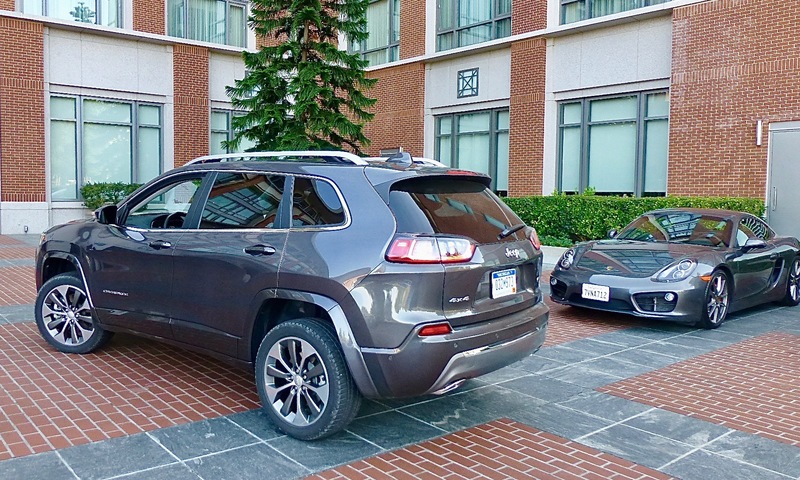 But I will give it this: No matter how much you like the current Cherokee styling, once you’re inside, driving or riding, you don’t even think of how the exterior of your vehicle looks. The inside of the Cherokee has grown up a bit, to reclaim the volume that puts it in its rightful place above the upstart Compass — even though I now think the Cherokee and Compass look remarkably similar. To be annoying, I asked various Jeep executives which they’re rather have now as a family utility, and most of them had trouble choosing. Cherokee retains smooth on-road performance and offers three engine choices. No, it departs from it. But that’s OK. Mainly because the new Cherokee’s heart and soul rises to new heights. It took a bit of probing conversations with chief engineer Paul Smith and Cherokee line engineer Mike Downey to get most of the information. 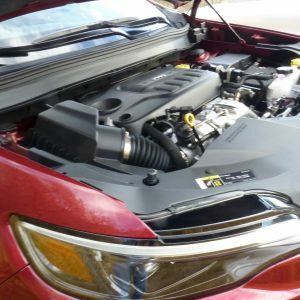 FCA (Fiat Chrysler Automobiles) uses a very neat 2.4 engine designed by Hyundai in South Korea, and it uses some slick induction tricks from parent company Fiat’s Alfa Romeo branch. When they said the 2.0 was a clean-sheet design by Chrysler engineers in Auburn Hills, Mich., I pressed on. 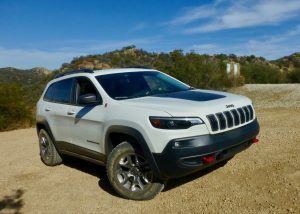 Reluctantly, they said this Cherokee/Wrangler 2.0 is basically the same engine as used by the amazing new Alfa Romeo Giulia sedan — Motor Trend’s Car of the Year, and also the choice of NewCarPicks.com. I suggested that the Jeep folks shouldn’t be shy about boasting that the engine is shared with such an illustrious car. Amazing! Alfa Romeo tinkers with the engine a bit, using its MultiAir system to activate the intake valves instead of an intake valve camshaft. On this side of the pond, Jeep uses dual overhead cams on the 2.0’s four valves per cylinder and direct injection. It puts out 270 horsepower at 5,250 RPMs and 295 foot-pounds of torque from 3,000-4,500 RPMs. The gem is a new 2.0-liter turbocharged 4, with power, zip and fuel mileage best of the batch. For easy everyday driving, the 2.4 supplies an adequate 180 horsepower and 171 foot-pounds of torque. 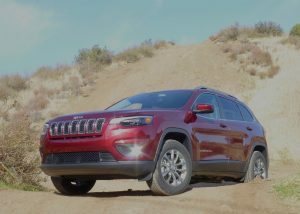 For towing heavy things, the Cherokee can be fitted with the 3.2-liter derivative of the proven 3.6 Pentastar, and it has 271 horsepower and 239 foot-pounds of torque. Think about it. The V6 has 271 horses to the 2.0 turbo 4’s 270, and the 2.0 turbo actually out-torques the V6 295-239. It may not have as much outright towing capability, but it has to be quicker and, if you can keep your feet from getting too far into the turbo, you probably could get better fuel economy. We were safe up at the ranch, which Jeep has used numerous times in the past, and on which Jeep folks have traced some amazingly challenging off-road driving courses. 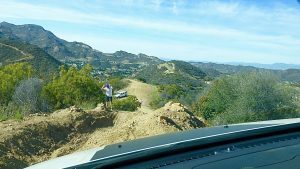 We took our turns climbing aboard the Trailhawk versions of the new Cherokee, and they have spotters out there, to make sure we believe we’re supposed to climb those rocks and get past those deeply rutted, boulder-filled regions. 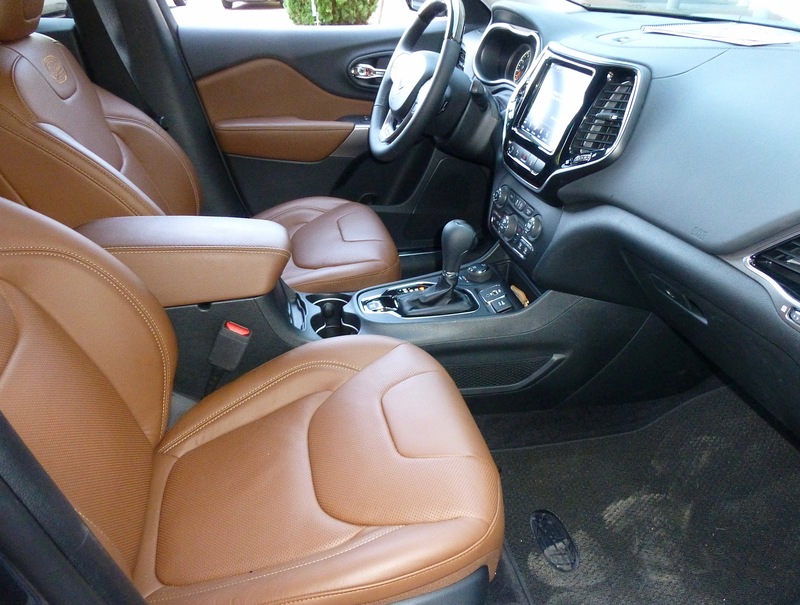 Overland model offers sumptuous leather seats in the redone Cherokee interior. You can pick your capability at order time, going with the basic Latitude, Latitude Plus, Limited, or Overland, with the heavy-duty-equipped Trailhawk at the top of the pecking order. All of those can be bought with either rear-wheel drive or 4×4, except for the Trailhawk, which comes only in 4×4 to complete its mountain-goat capabilities. You can choose engines, and with any of the three you get the 9-speed automatic tuned to handle all duties. The 2.0 turbo is not available in the base Latitude and is optional on all the other models. Typical of Jeep, you also can choose what off-road system you want, including System III with Active Drive I, Touring, which as Active Drive II, or rear-lock which is Active Drive III. Prices range from the Latitude 4×2 $24,990, to the Latitude Plus at $27,490, Limited at $31,370, Overland at $37,270, and the Trailhawk at $34,315. It costs another $1,500 to add 4×4 — and, frankly, what red-blooded Jeep customer would not want 4×4? 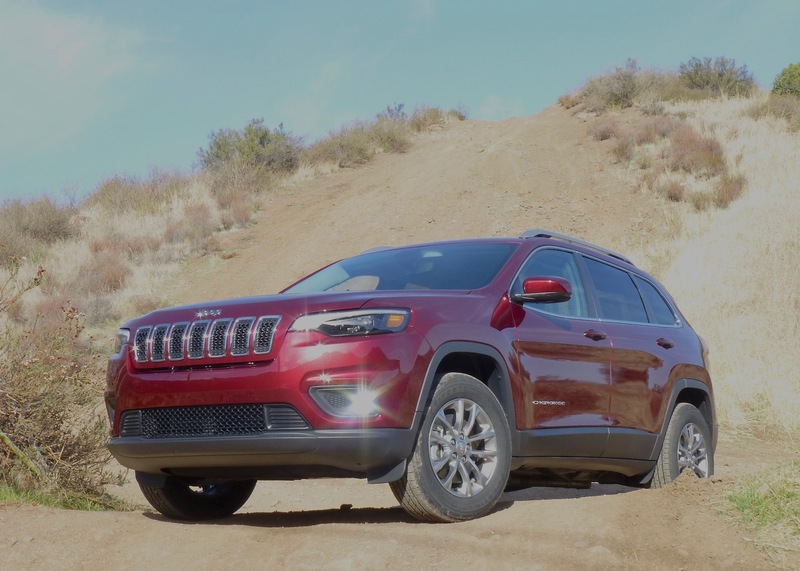 Trackhawk’s hill-descent control allows Cherokee to tiptoe down virtual cliffs with ease. All the latest connectivity stuff is either standard or available, and the headlight and tail lights are LED, as are the daytime running lights. The 2019 Cherokee is all new from the front pillars forward, with aluminum hood, new fenders, and the different nose. A capless fuel door, and a composite liftgate are standrad,, and either a 7 or 8.4 inch navigation screen. While the dashboard, console and instruments are a major step forward, there are also little touches, such as the tailgate, which swings up if you have the key fob on your person, and you wave your foot under the rear bumper. Others have had this, and if you’re approaching with four grocery bags in your arms, you appreciate the convenience of the “kick wave” device, for not having to set them down in 6 inches of snow while you grapple for your keys. 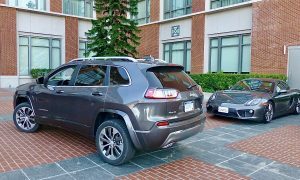 The new Cherokee is 182 inches long (to 175.1 for the Compass), with a wheelbase of 107 inches (to 103.7), and it’s 73.2 inches wide (to 71.4), with a height of 65.7 (to 65). It also has a 4,000 pound towing capacity, or 4,500 with the V6. 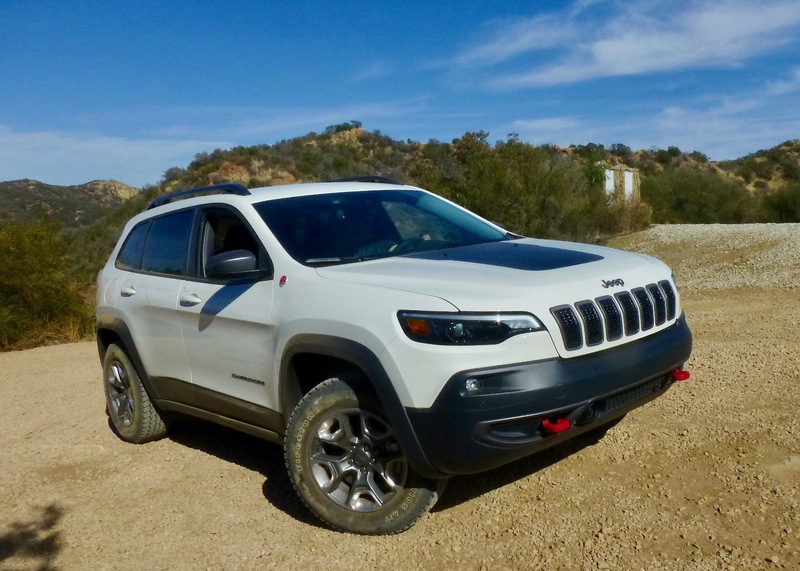 All of that should allow the new Cherokee to climb back ahead of the new Compass and regain its rightful place in the Jeep family.